This machine is in absolutely PERFECT condition. 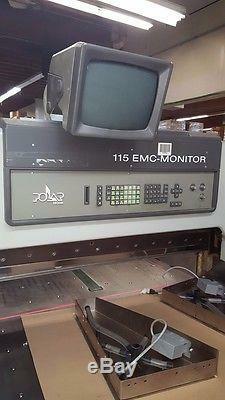 It is one of the very last EMC models that were made prior to the newer E & ED models. Machine is complete with 1 meter over-sized air tables and has air on the main bed as well. The cut buttons are mounted on nearly new stainless steel transition corners that keep Large Sheet stock from hanging off of the bed when moving it into / out of the knife area. This machine was located at a local paper company, not a Commercial Printer or Binder. It was used very little and maintained at the highest levels. Air Bed on Main & Side tables. 3 Knives (high speed steel). Factory Toolbox, Knife Change Stands, Manuals for operation. 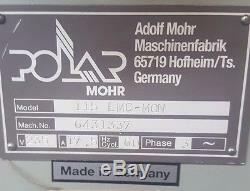 The item "1994 Polar 115EMC Monitor 45 paper cutter PRICE REDUCED $2000" is in sale since Tuesday, April 18, 2017. This item is in the category "Business & Industrial\Printing & Graphic Arts\Bindery & Finishing Equipment\Paper Cutters & Trimmers".e" and is located in Tualatin, Oregon. This item can be shipped to United States.